Chaos. That's my most lasting impression of this episode, which adds on to last week's parade of guest stars by bringing in Jackie Tyler and Mickey Smith over the opening credits. Not that they're not welcome, mind you. I like those characters. But is there any more room in an episode that already has Rose, Torchwood, Martha, Donna, Sarah Jane, Daleks, Davros, and special guest star Dalek Caan? (And, somewhere offscreen presumably, K9.) Well, yes, but not a lot of room. Clearly Davies, though on for next year's specials, is tidying up the little universe he's built over four seasons before moving on. 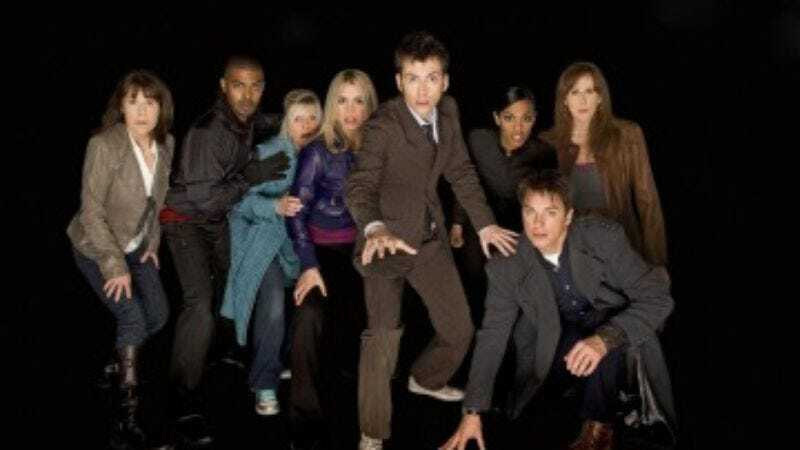 "Journey's End" starts out reasonably self-contained, if only because so many characters are in one place, being menaced by the Daleks after the Doctor's failed regeneration. (Did anyone not call that as a fake-out?) There's even room for some poignancy as the Doctor watches both Donna and the TARDIS get threatened. (Which bothers him more? You decide!) Then the naked semi-clone shows up and the whole thing shifts into some kind of weird overdrive. In Doctor Two we get Tennant emphasizing the most exaggerated tics of his performance and of Catherine Tate's Donna. (Tate responds in kind.) The music makes a comic shift signaling the first of many tonal changes that will plague trouble the rest of the episode. I confessed last week that Davros was new to me so the impact of his arrival was a little blunted. I've watched this episode one and a half times now and I think I get his role a little better. But for such a big-deal bad guy, I'm not sure he's given enough breathing room. The revelation that Dalek Caan had made him a servant of the Daleks came as kind of a shrug to me. But I do love the exchange between Davros and the Doctor in which Davros starts to stir some our hero's old ire, causing Davros to refer to a past in which the Doctor "butchered millions." Maybe that's why, following the failure of the Reality Bomb–courtesy of a Time Lord-infected Donna–and the revelation of Dalek Caan's betrayal of his own bloodthirsty people, he can still be upset at Doctor Two's decision to destroy the remaining Daleks. By Doctor Two's reckoning, he has no choice. Here is a pitiless race determined to dominate the universe. He flips the switch and kills them all. It's probably the same decision that the Time War-era Doctor would have made. And it might have been the one this Doctor would have been forced to make if it weren't for his semi-clone. Much of the season has dealt in Time Lord realpolitik and the hard decisions someone with the Doctor's power would have to make when there are lives in the balance. Doctor Two doesn't have to think about making the decision the Doctor would have to think about. Does this episode let him off the hook by putting the switch in somebody else's regenerated hand? It's not the only moment in which Doctor Two does something the Doctor can't, either. He gets left behind with Rose as an almost-but-not-quite-the-Doctor consolation prize for her devotion. I'm not sure what to make of this. Davies couldn't bring the Doctor and Rose together but leaving them apart would be heartbreaking. This again seems like a bit of a cop-out, but it fits a larger scheme of letting Doctor Two do what the Doctor can't. He kind of does what fans sometimes think they want the Doctor to do. 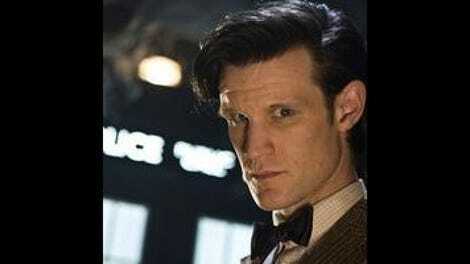 He can go Rambo on the Daleks and make out with his comely, smitten companion. But it's these things that make him not the Doctor. Anyone doubting the Doctor wishes he could step out of his role once in a while need look no further than his face as Doctor Two claims Rose as his own on that faraway beach. Now on to the other part of that regerneration-gone-wild: Donna really gets the short end of this deal, doesn't she? Her character has been defined all season by her need to explore the stars and we leave her worse off than before. She's proven herself a hero but she's left with no memories of her heroism or what she could become if she decided to leave her temp life behind. It's an ending with no poetry in it. I just hope we haven't seen the last of her. But we have seen the last of this particular phase of Doctor Who, haven't we? Sure, the specials are coming, but the sense of a chapter closing was only reinforced by that lovely, downbeat ending. After an overstuffed adventure, the Doctor is left alone. Really alone. No sidekicks, past or present to keep him company, he enters the TARDIS and at the moment we've come to expect some tease for the season to come we get… nothing. Just a sad Doctor, not quite at peace with the burden of being a Time Lord. There's more to come, of course, but it won't quite be the same. And while I wish Davies had tried to do a little less in this conclusion, that final moment made getting there worth it. "It's been good, though, hasn't it? All of us? All of it? Everything we did? ", the Doctor asks at one point. All of it? No. But way more than enough.